Hello hello, it's great to see you back again! Ooh, it's an exciting day ... are you ready to make a start on your Patchwork Socks? Before we start, I need to warn you that there are lots of photos in this tutorial, plus video links! I created this pattern to show off mini-skeins of yarn, although you could just as easily use leftovers. I like the idea that multi-coloured socks don't have to be striped or variegated and that we can create the blocks of colour for ourselves which works perfectly with the intarsia method of knitting. 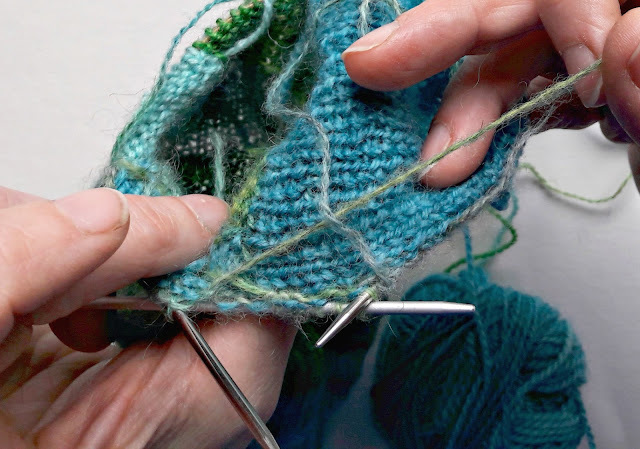 Although the intarsia technique is more usually knitted flat, this sock will be knitted in the round so don't worry that there are going to be any seams to sew up. It might seem a bit fiddly at first but it's really not hard to do and there is nothing complicated that you will need to practice first. What I really like about this patchwork pattern is that you have free reign to do whatever you like! 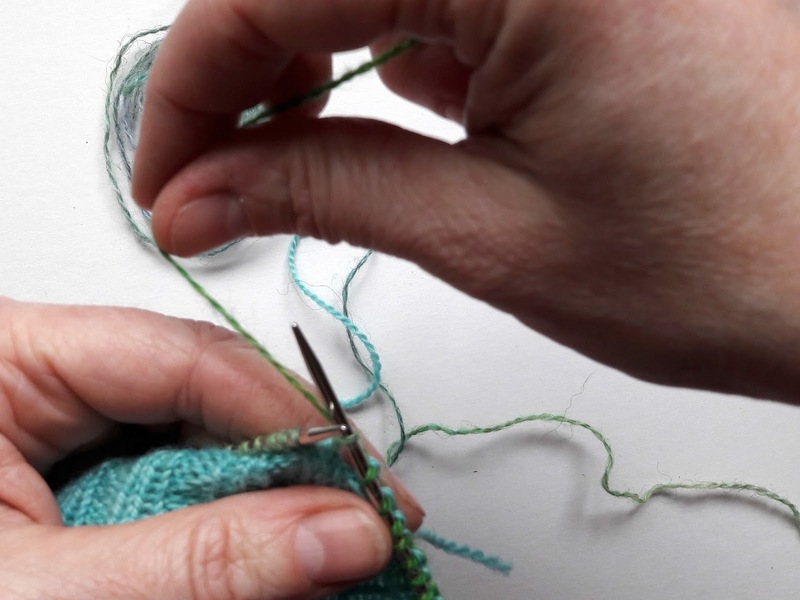 It can feel a little odd at first to be making it up as you go along - after all, most of our knitting is done by following a pattern that's been written to create something that looks exactly the same as the pattern picture - but once you realise that you can't go wrong, it's surprisingly liberating. You can make your squares as big or as small as you want to, you can add rectangles in here and there and who's to say that anything you knitted wasn't intentional? You have permission to do your own thing! The heel is a heel flap and gusset-type heel which you will very familiar with from other patterns that I've written. 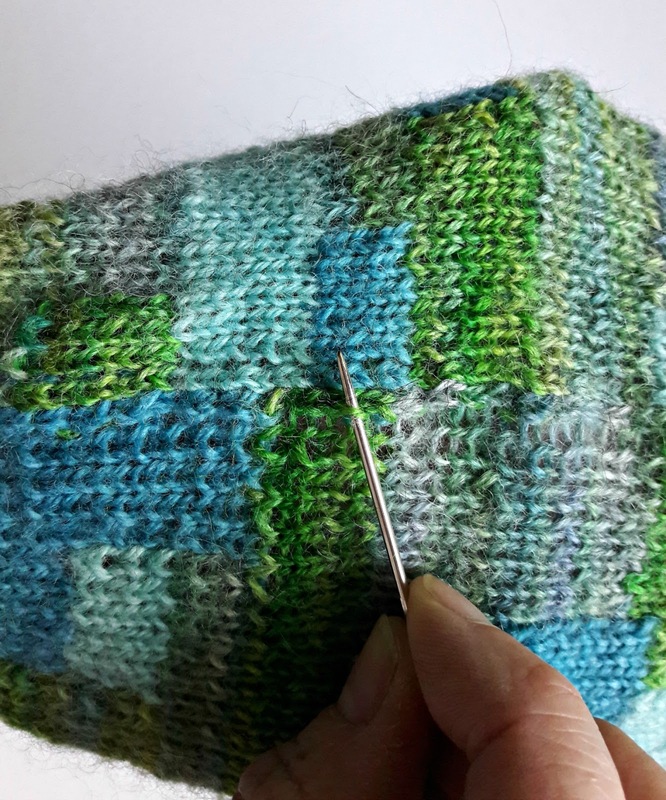 I've used the ribbed heel stitch which I first used on the Candy Cane socks; it's a bit stretchier than the usual heel stitch so if you're someone who finds a regular heel flap a bit tight across your foot, then using this stitch should make a bit of a difference. It's super-easy, and it also works very well if you want to use it for reinforcing the soles and toes of socks too - just replace the regular heel stitch with this one. Before we launch into the pattern, I just want to tell you about the wrap and turn technique that I've used with this sock. It's pretty much impossible to not see a join at all, but there's a trick you can do later to improve the appearance if you find that it doesn't look the way you want it to which I'll show you, and the visibility of the join does seem to work out slightly differently depending on the yarn that you choose too. I've written the pattern so that the seams are mirrored so that you can choose to wear them both on the inside and then nobody will ever notice them. Basically, all that we're going to be doing is knitting around the sock in the usual way to start off, but when we get to the end of round, we're going to turn our sock around and work back the way we've come. That's all there is to it! 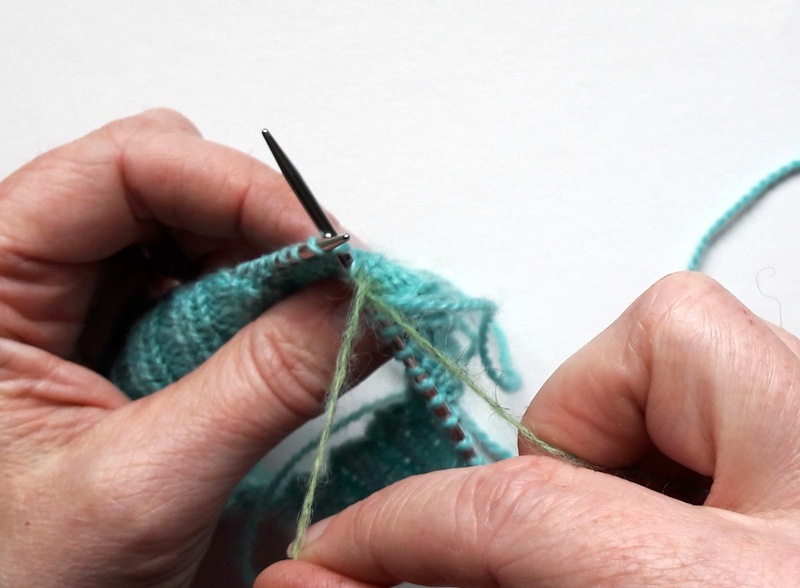 It means that one round will be knit and the next will be purl, but you'll be able to pick up your colours as you come to them and there won't be any issues with yarn loops inside your socks. 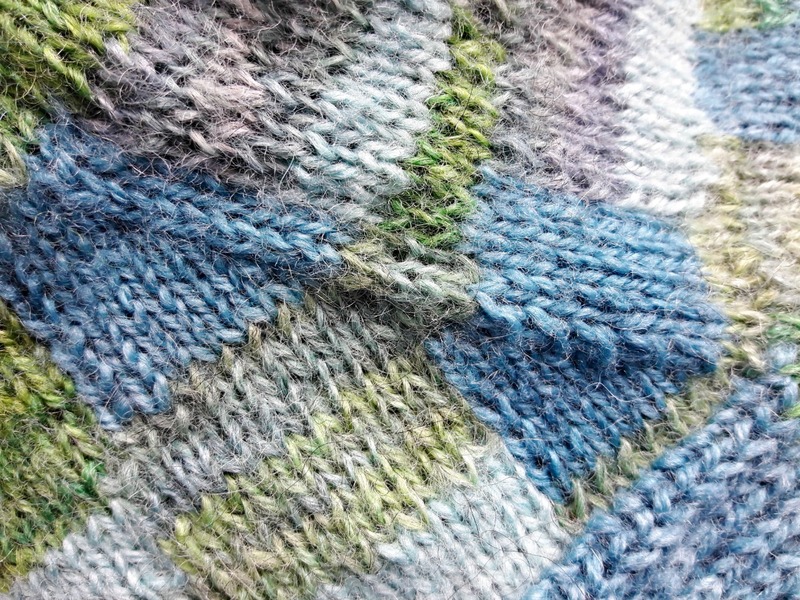 When you get to the end of your round, you wrap the yarn around the next stitch and turn you work, and then when you get to that wrap on the next round, you pick it up and knit it - that way you never notice it, although you might like the idea of leaving it as a design feature as it looks a bit like sewn stitches. I've got plenty of photos and videos to show you how it works, but it's really not as hard as you might think! Right then, let's get started! 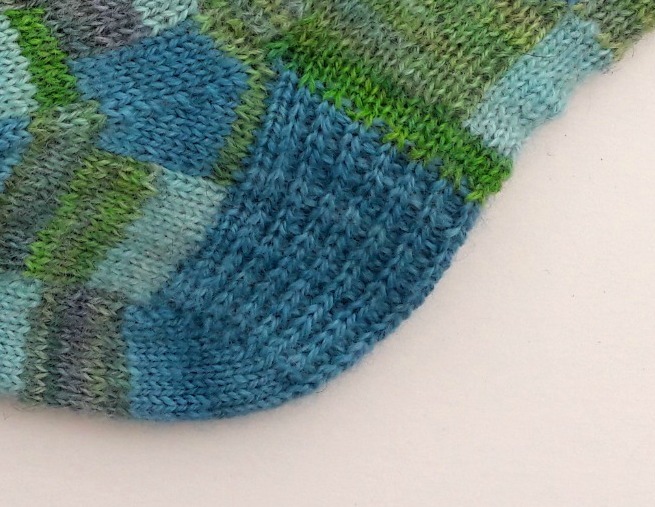 These socks are constructed as top down socks with a heel flap and gusset. The heel is knitted in ribbed heel stitch, which creates a durable, cushioned heel. 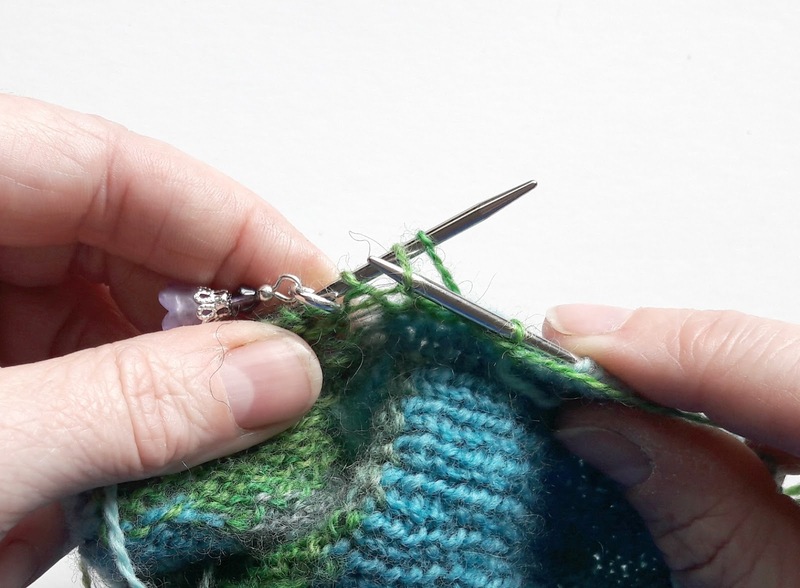 The intarsia method is used for creating the patchwork squares and because the socks are knitted in the round, a wrap and turn is used which means that every other round will be a purl round. 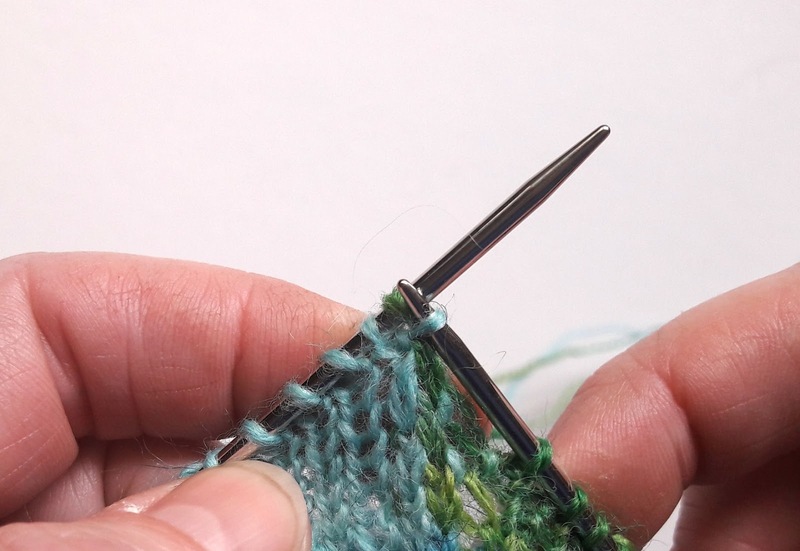 2.5mm needles - I use a 30cm needle but DPNs or an 80cm circular for magic loop will also work. 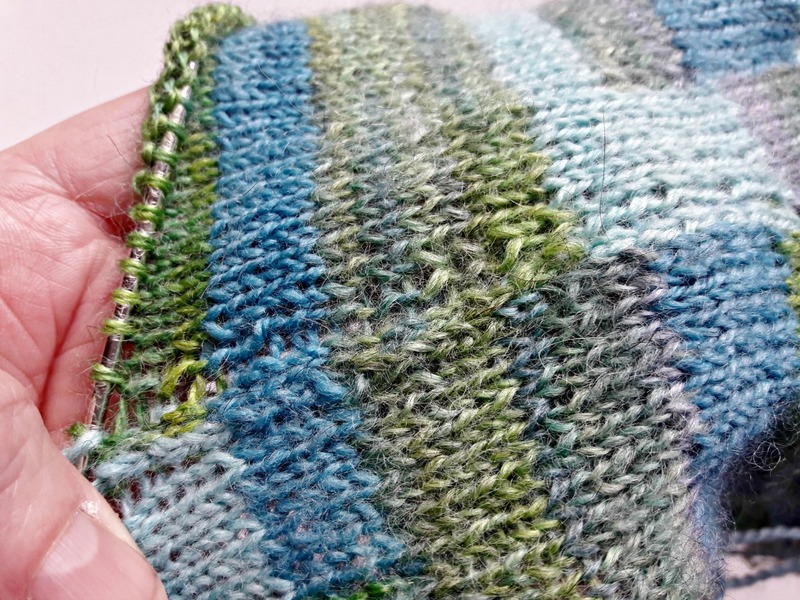 This pattern as written will create a medium-sized sock. The gauge is based on 7-8 stitches per inch (2.5cm) on 2.5mm needles knitted in the round (30 sts to 4 inches (10cm)). To adjust the size for this sock, just add or remove stitches in blocks of 4 from the cast on total but it's always best to calculate the correct number of stitches for your foot before starting - you can find a stitch calculation method and step-by-step photo tutorials here. Remember that you will need to make adjustments when turning the heel if you more or less stitches. P2togtbl Purl the next two stitches together by putting your right hand needle through the stitches from left to right at the back of the left hand needle. 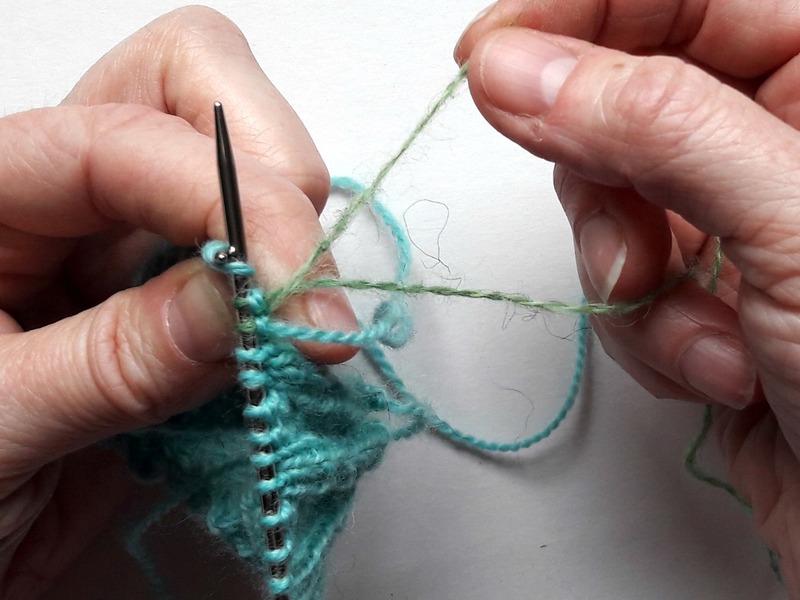 As an alternative, knitting expert Barbara Walker's method of purling the next stitch on the left hand needle, slipping the purled stitch back onto the left hand needle and slipping the second stitch on the left hand needle over the purled stitch can be used instead. 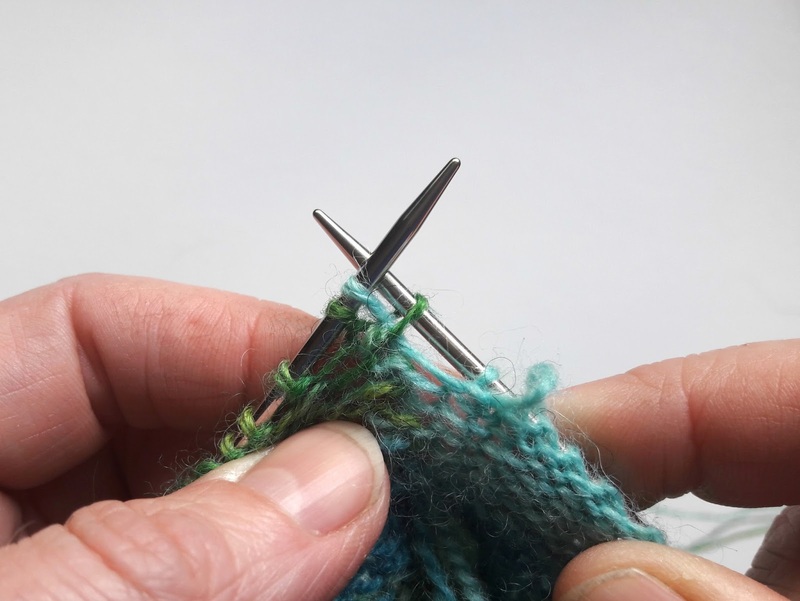 Note: It is often easier to cast on using DPNs before changing to the 30cm circular needle. If you want to use magic loop you will be able to cast on with the larger circular needle if you prefer to do so, but remember not to pull your cast on stitches too tight. If you use DPNs, you might find it easier to cast on and work 2 rows before dividing the stitches across the needles. 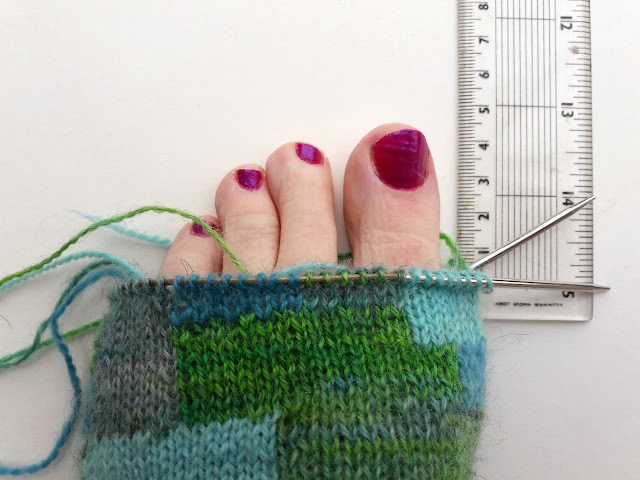 I have given approximate numbers of rounds to give you an idea of how much to knit depending on your foot size - these are just a guide and will change with tension and yarn used, so don't worry if your knitting doesn't match exactly. I also chose to weave the ends of the yarn in as I went along to avoid too much sewing in later, but it's up to you what you choose to do with the ends of your yarn. 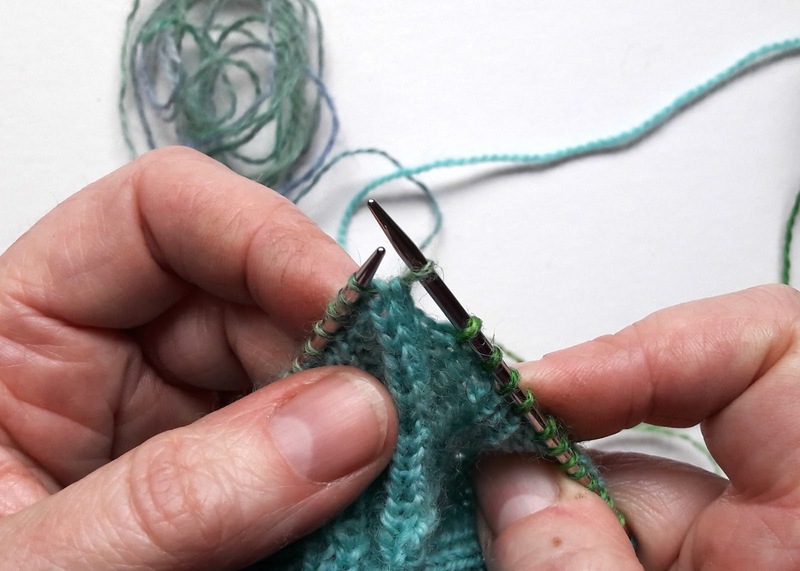 Cast on 60 stitches using 3.0mm double pointed needles. Change to 2.5mm needles. 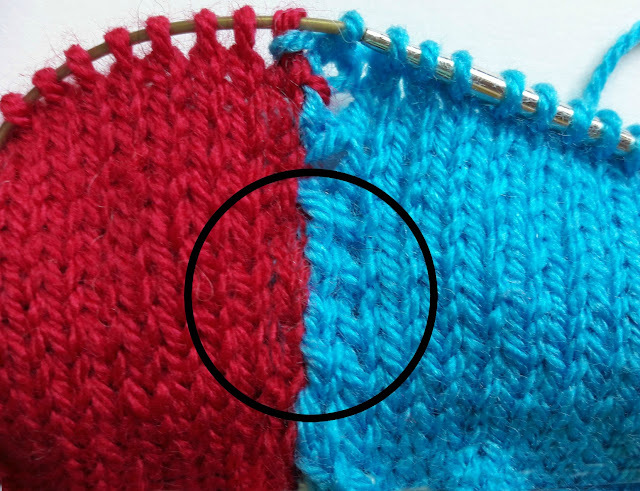 At this point, change to a small circular, magic loop or divide the stitches across DPNs and join into a circle, place marker. Continue in K2, P2 rib for 14 more rounds or desired length of rib (I knit 16 rounds of rib). I have not given charts for how you should put the patches together - simply follow the instructions below and make your patchwork socks unique! All I would say is that the more colours you use at any one time, the more risk of tangled yarn so either cut lengths of the yarn to work with or make sure you untangle them on a regular basis. 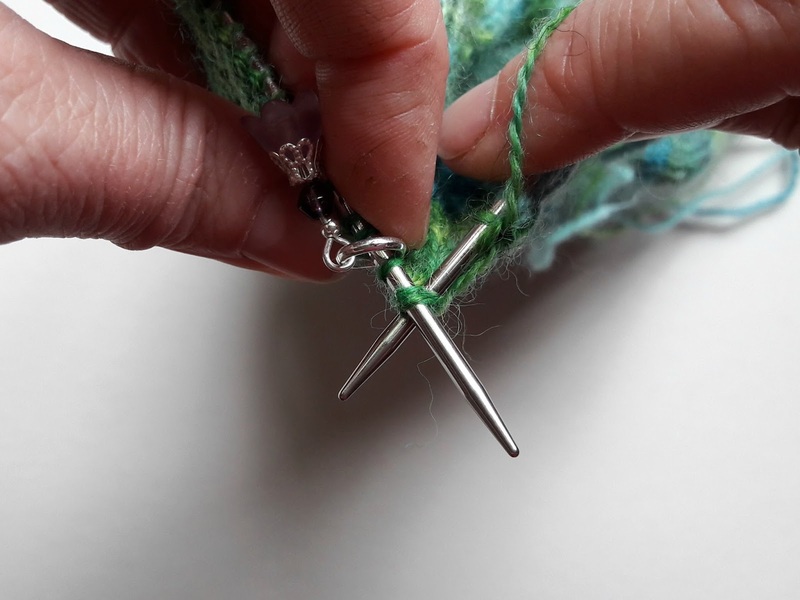 I have written these instructions to include the use of a stitch marker on the leg and foot sections, but you may find that it becomes easier not to use one as you will use the wrapped stitch as your marker. 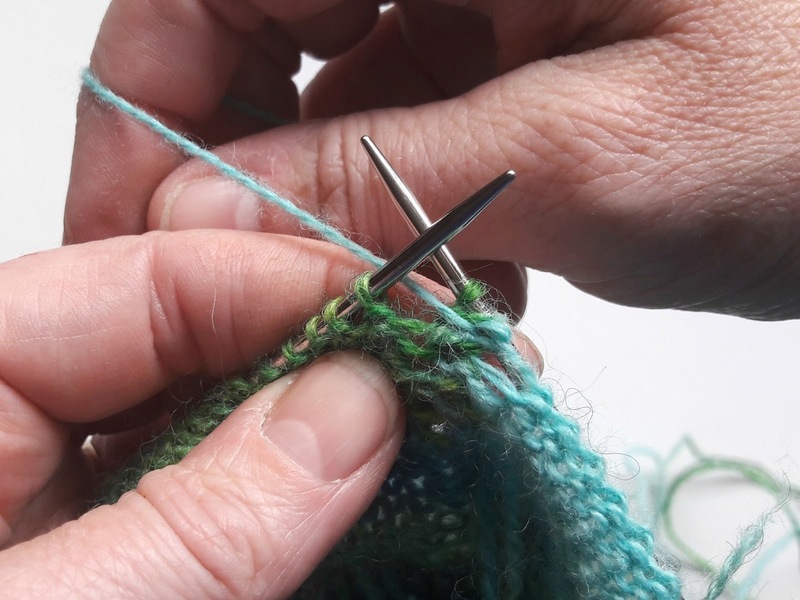 If that's the case for you, don't worry about taking the stitch marker off as you will always know where the start and end of your round is by the wrapped stitches. Start the leg section by using your first new colour, join the yarn by twisting it around the cuff colour so that you don't get a hole. and then downwards over the working yarn again when you knit the next stitch so that the tail end is firmly anchored. You can see how it works in the video (link below). 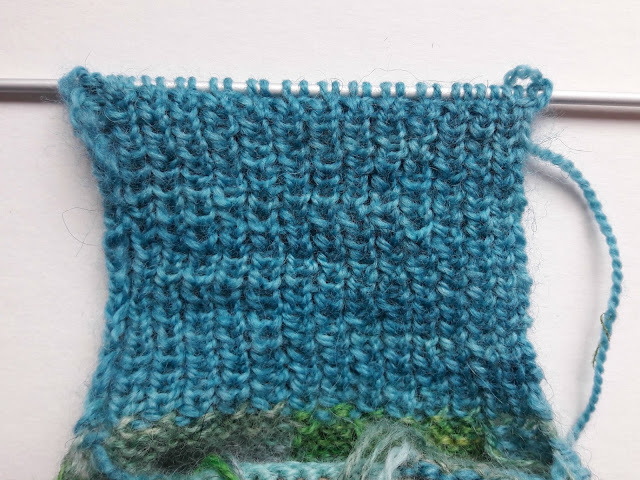 Knit for as many stitches as you want your first patch to be, then join in a new colour, and another until you have as many yarns joined in as you would like, remembering to twist the yarns as you join them so that you don't get a hole where the colours meet. When you reach the end of the round, it's time to create the first wrap. then follow the instructions for all purl rounds. 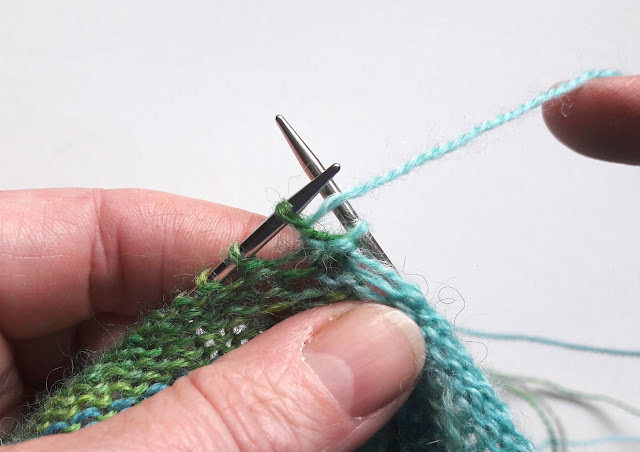 Note: don't pull the yarn too tightly when you wrap the stitch - if you leave it quite loose, it's easier to adjust the stitches later so that the join is not as noticeable. 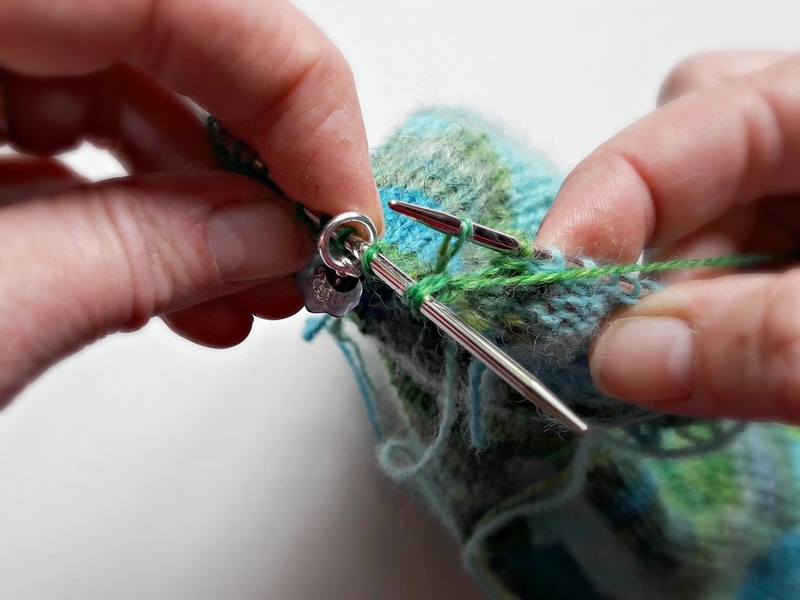 and purl it together with the stitch that it was wrapped around. 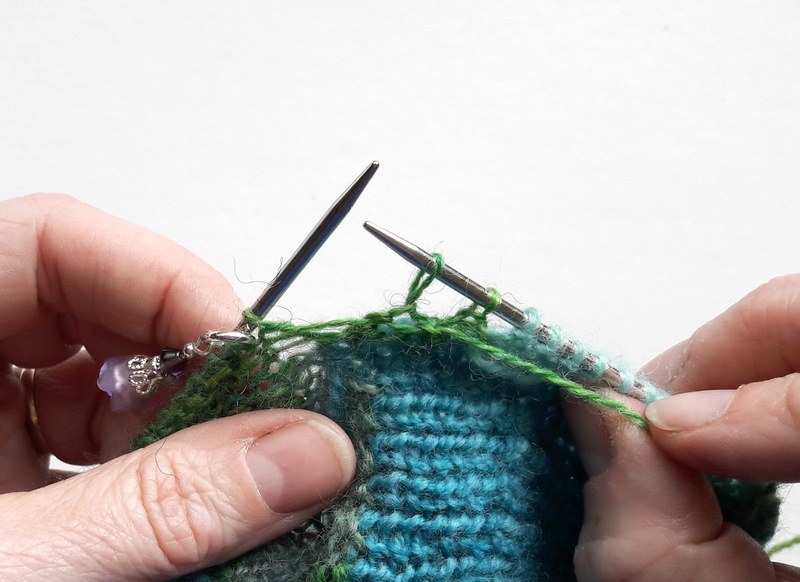 slip the stitch back from the right hand needle to the left, slip the stitch marker back to the left hand needle and turn your sock. 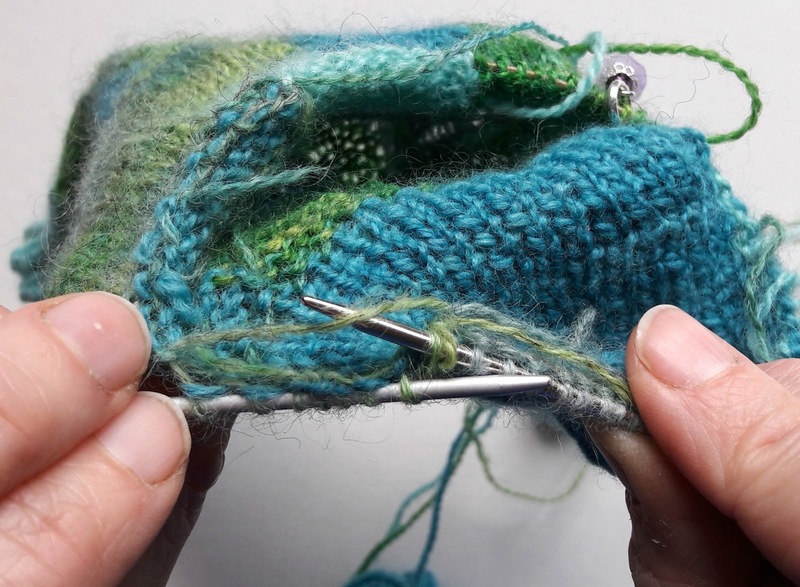 You are going to knit the next round so continue the wrap to bring the yarn to the back of your work, then follow the instructions for all knit rounds. and knit it together with the stitch it was wrapped around. slip the stitch back from the right hand needle to the left, slip the stitch marker back to the left hand needle and turn your sock. 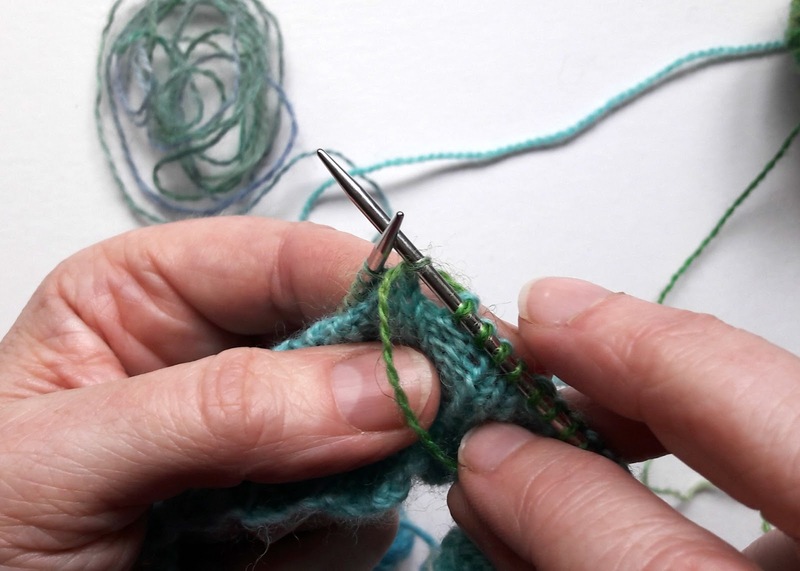 You are going to purl the next round so continue the wrap to bring the yarn to the front of your work, then follow the instructions for all purl rounds. Note: don't pull the yarn too tightly when you wrap the stitch - if you leave it quite loose it's easier to adjust the stitches later so that the join is not as noticeable. 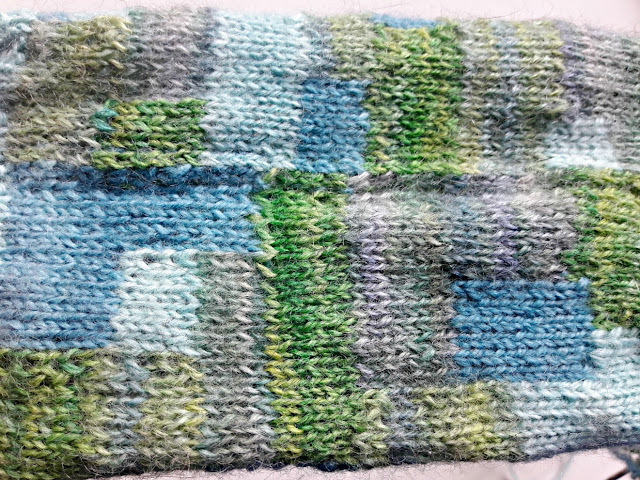 Change colours as often as you like so that your patchwork blocks show off your yarns, breaking the yarns and re-joining them according to your preference. I found that the socks look better if you make bigger patches rather than smaller ones as they can get a bit lost in the overall sock. 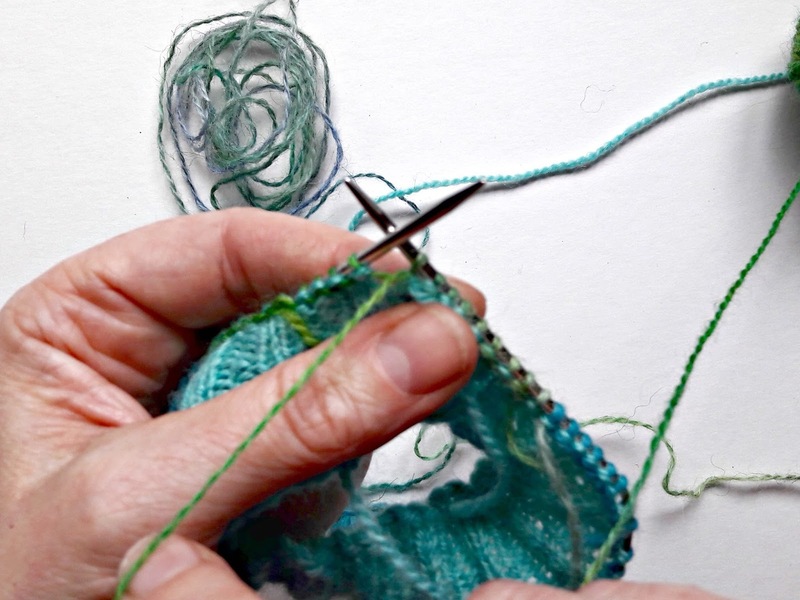 Do be aware that your yarns will get into a tangle as you go along, so you'll need to keep untangling them. Using long lengths rather than balls can be helpful here. 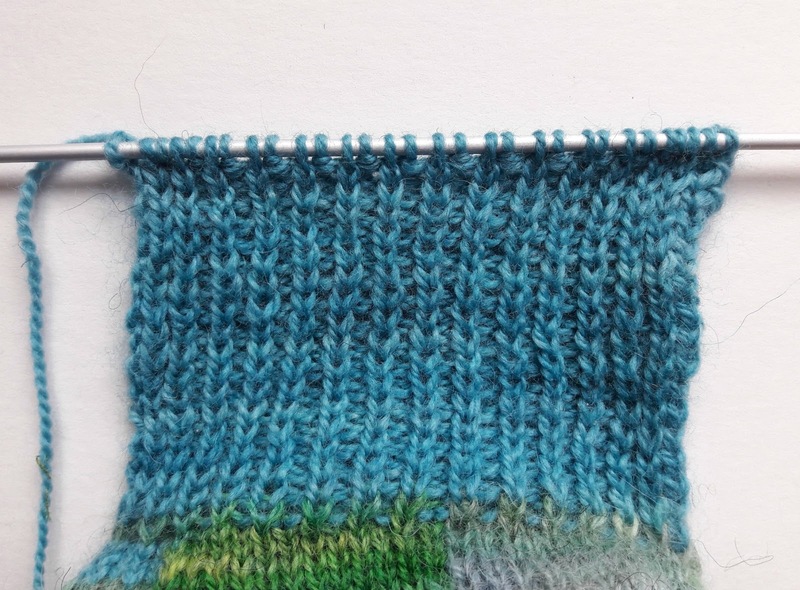 Continue to knit or purl each round until you reach the desired length before the start of your heel (for me, this is about 6 inches (15 cm) - usually around 72 rounds in total including the rib). 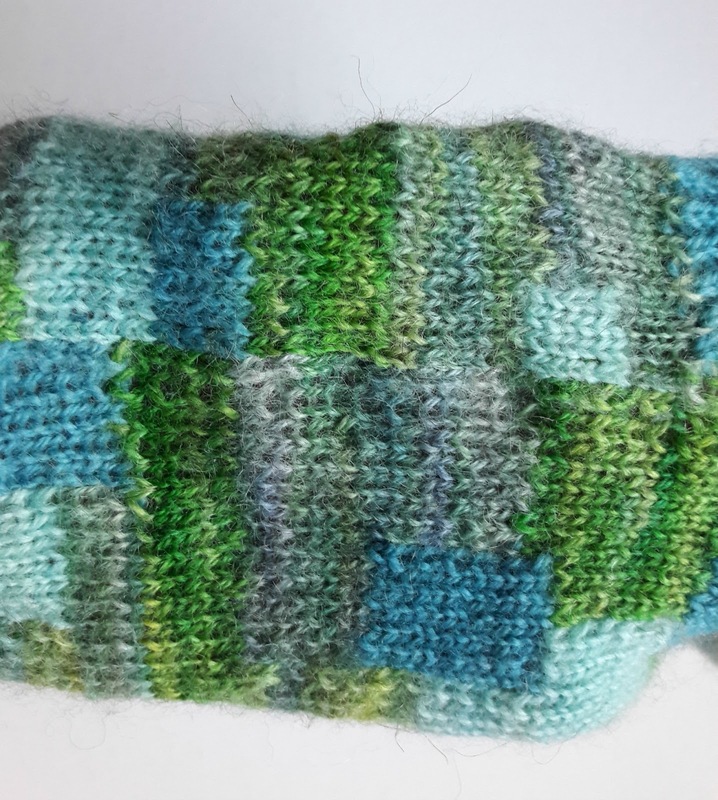 I found it easiest to work the heel flap in one colour, but you could continue with your patchwork colours or even stripes if you wanted to - just be aware that joins in your rows on the heels could become weaker areas which may rub into a hole if you are heavy on your heels in hand-knitted socks. 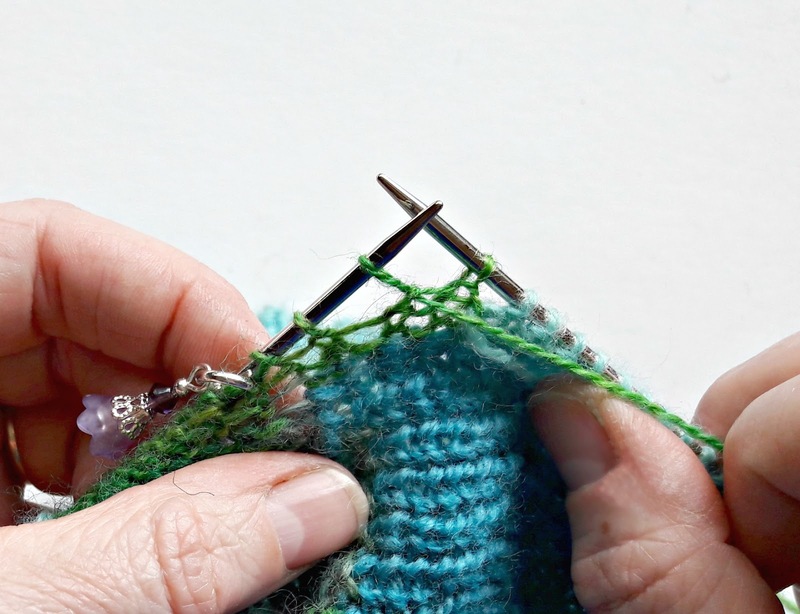 Change to 2.5mm DPNs if you are using a short circular needle. 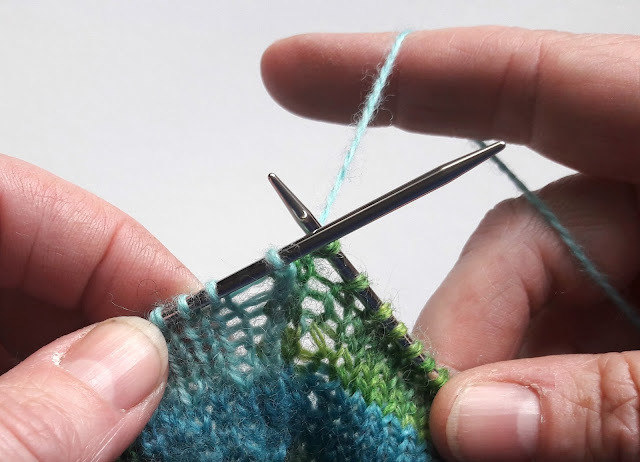 You are going to create the heel flap from half the number of stitches that you cast on, so if you have cast on more or less than 60 stitches, remember to adjust the number of stitches when you start the heel flap. 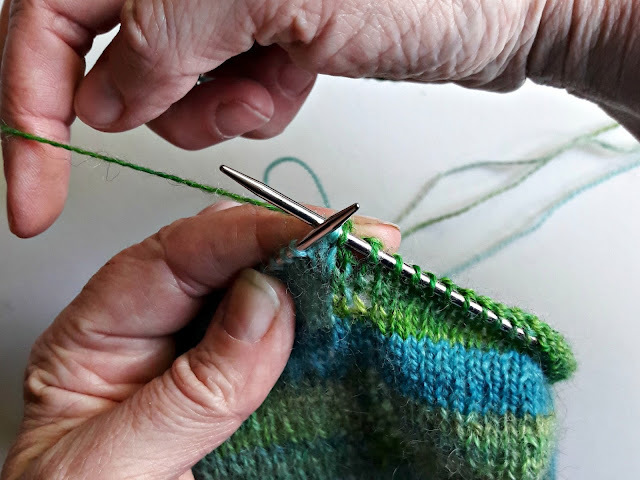 To create the heel flap on the other side of the sock so that the joins of each sock will be on different sides (ie, both on the inside or both on the outside), work 30 stitches in patchwork pattern before you start the heel flap on the second sock. Repeat rows 2 and 3 until heel measures approximately 2 inches (5 cm), finishing on row 3 (for me this is approximately 35 rows). 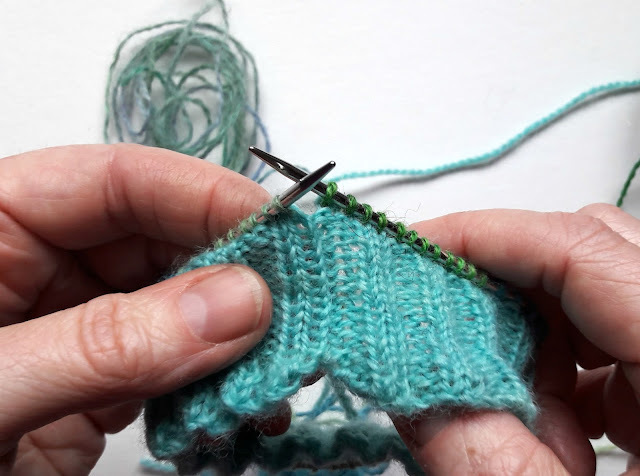 If you want to make the heel flap longer (it's good to do this if you have a high instep), continue knitting rows 2 and 3 until you reach the desired length, but remember that you will need to pick up more stitches to create the gusset. and knit rather than purl rows on the inside. 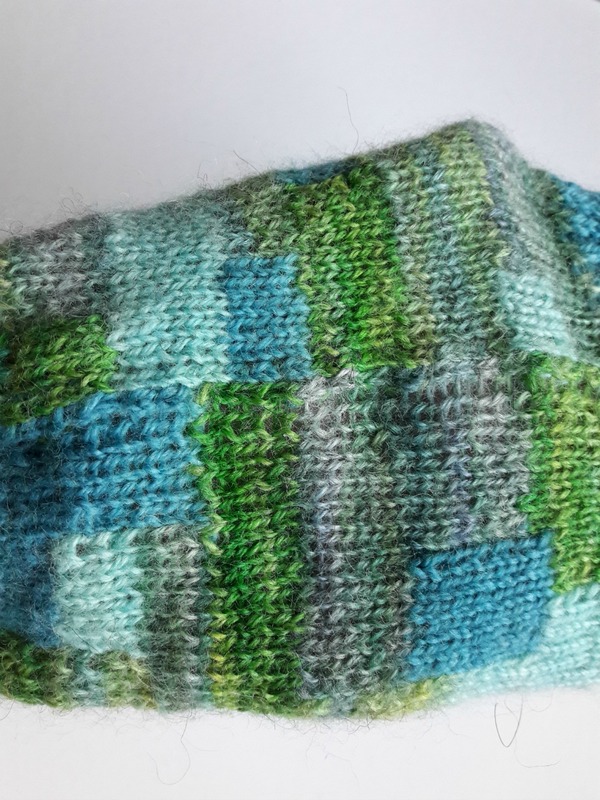 I chose to work the heel turn in one colour as I thought it would be more comfortable but you can continue the patchwork colours if you want to. 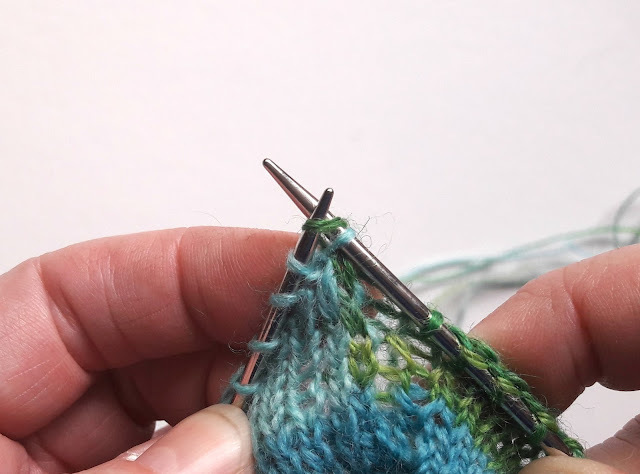 Continue in this way, increasing one stitch between slip stitch and SSK or P2tog on each row until all of the heel stitches are used (ie, Row 5: Sl1, P8, P2tog, P1, turn; Row 6: Sl1, K9, SSK, K1, turn, etc). Note: You're not making any new stitches, you're simply adding one stitch to the number in the centre every time you decrease. 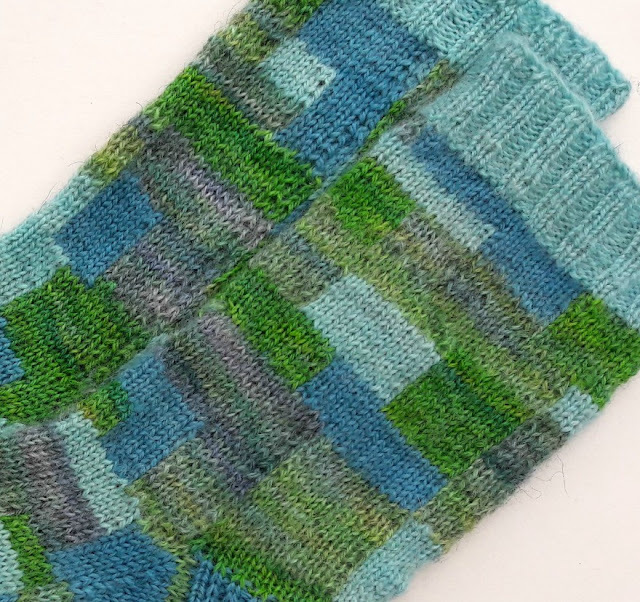 To continue the patchwork through the gusset and down the foot, you will need to join new yarns for the gusset so it is recommended that you read through the instructions first before you start. First, you need to decide on the colour for the sole of your foot - if you want to keep it the same as your heel, you will need to ensure that the working yarn is on the right hand side of your heel flap as you look at it with the outside of your heel flap facing you, otherwise you can use that yarn to pick up your first set of gusset stitches so it will need to be on the left hand side of your heel flap as you look at it. 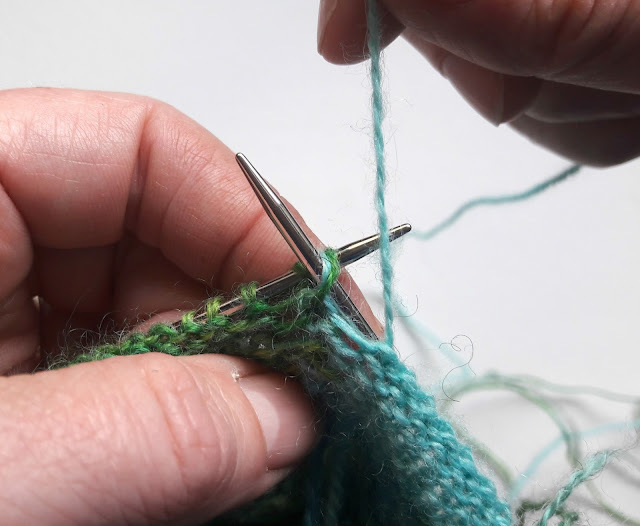 wind the yarn around and knit the stitch as usual, pulling it underneath the loop to anchor the yarn under the working yarn. 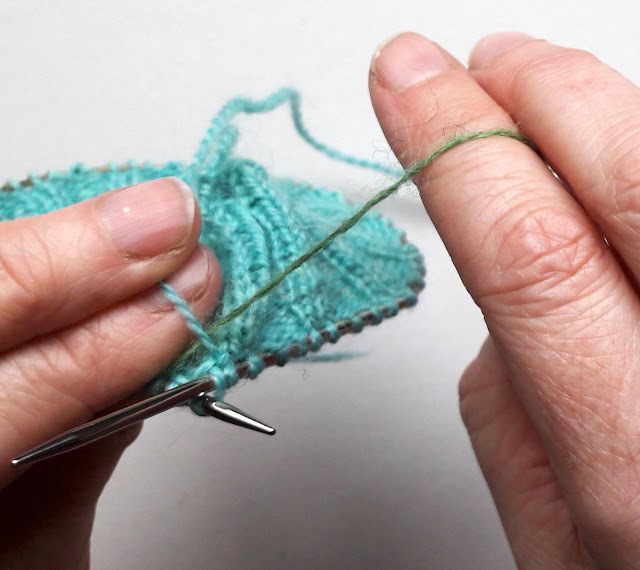 You only need to do this every few stitches as you knit so that the float won't catch on your toes as you put your sock on. 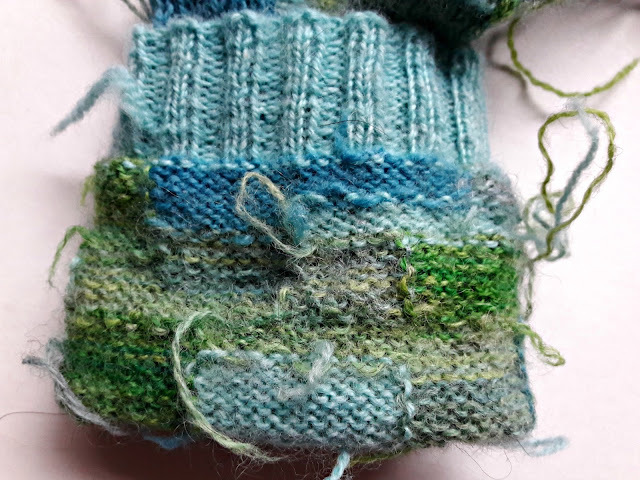 When you have worked the top of the foot stitches, place marker then pick up 1 stitch for every 2 rows of heel flap knitted up the other side of the heel. You will need to join new yarn for these stitches. 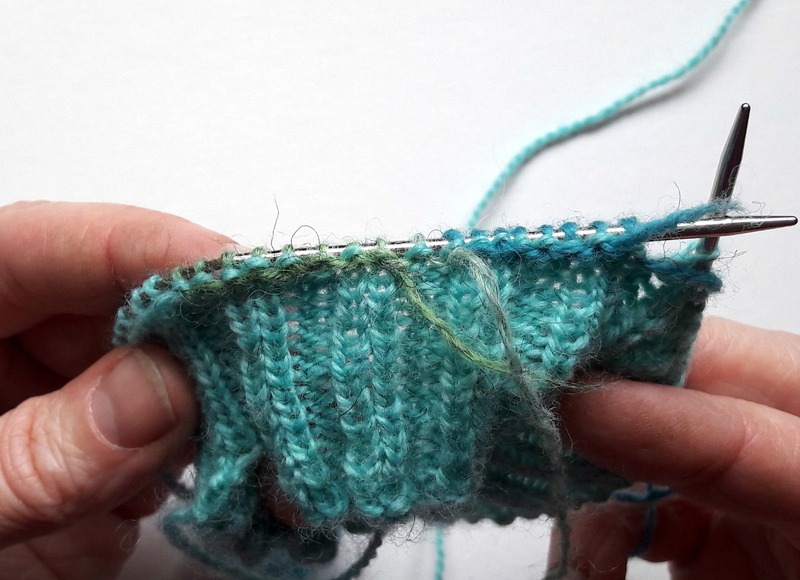 Knit across the top of the heel stitches using the yarn that you used to complete your heel turn, or join a new colour if preferred. When you get to the first set of picked up stitches again, you will need to create floats as you may have done with the top of the foot stitches, anchoring the yarn with the working yarn so that the floats are not too long. 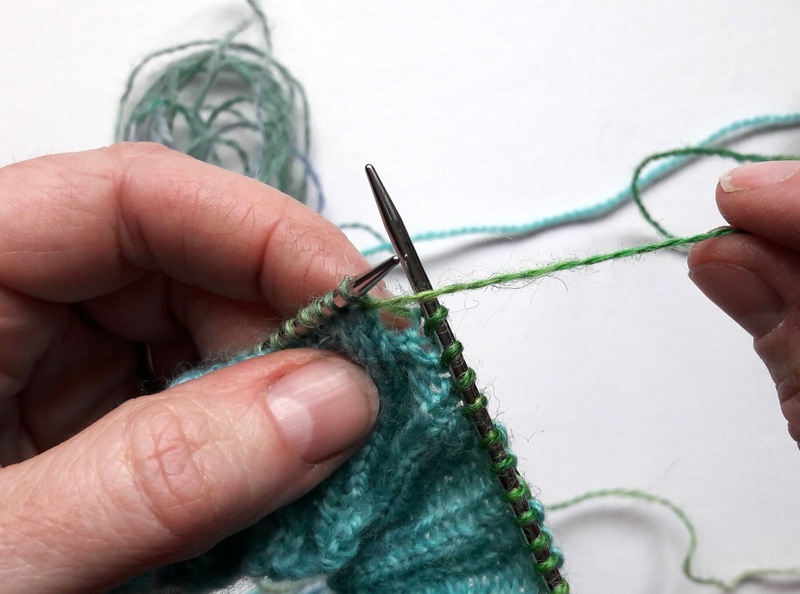 Gusset decreases - read this first: When you reach the decreases for the gusset, you'll create the K2tog decrease just as you would do for any other sock, but as you're working backwards and forwards around your sock, you'll need to do a purl decrease when you're on the purl side. Purling two stitches together won't give you the right effect so the technique used is to purl two stitches together through the back loop. and then purling them together. It's fiddly but it's do-able. and that will give you the same effect - and you're not contorting your hands to do it! Round 1: K to 3 sts before the end of the first set of picked up stitches, K2tog, K1, wrap yarn around next stitch and turn. Purl back along the stitches until 3 stitches before next marker, P2togtbl, P1, purl across top of foot stitches to wrapped stitch, pick up wrap and purl stitch, turn. Round 2: Knit in pattern to next marker, slip marker, knit to 3 sts before marker. Round 3: K2tog, K1, wrap yarn around next stitch and turn. Purl back along the stitches until 3 stitches before next marker, P2togtbl, P1, purl across top of foot stitches to wrapped stitch, pick up wrap and purl stitch, turn. Repeat rounds 2 and 3 to shape the gusset. Continue in this way, decreasing by two stitches at the gusset on every other row until there are 60 stitches on the needle. If you want to take your markers out because you can use the join line as your marker instead, you can do this now. Once you have 60 stitches again, continue to knit and purl each round in your patchwork pattern until you reach approximately 5cm before the desired length ready to start the toes. For my size 5 feet, this is about 45 rounds. Don't be afraid to try your sock on before decreasing for the toes and make sure that you're standing up as you need your full weight on your foot. Sometimes you have to work more rounds than you think to get to where you need to be, but it's always worth doing that so that sock is the right length - otherwise it will pull against your toes and under your heel which isn't very comfortable! 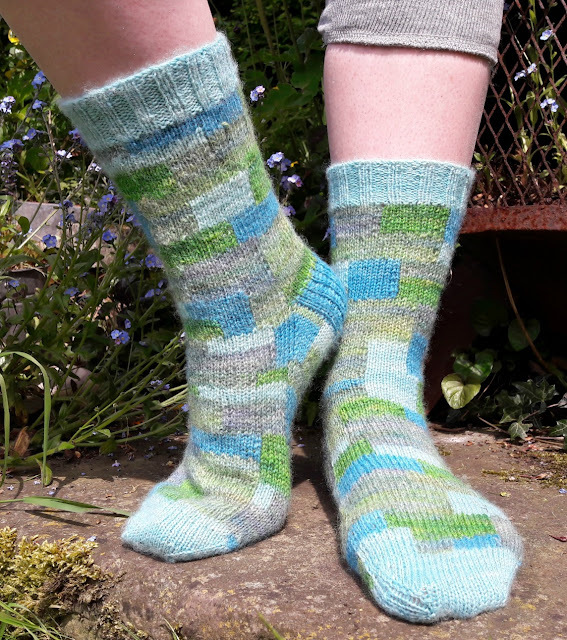 I've chosen to knit the toes in one colour but you can continue the patchwork pattern if you want to - just be aware that the joins between the colours might become a weak spot for pokey toes! 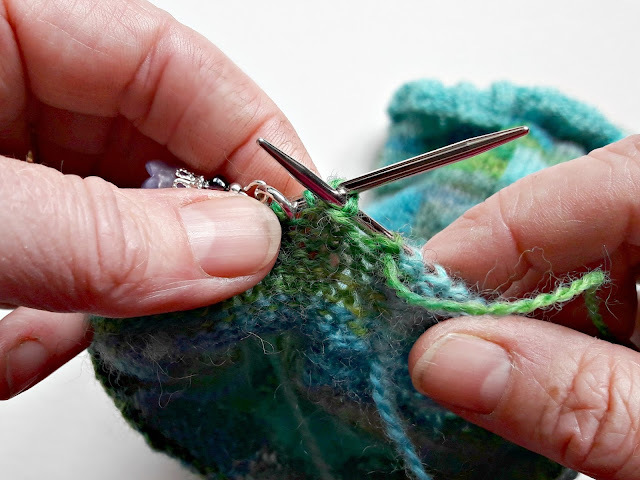 At some point whilst decreasing for the toes, if you are using a short circular needle you may need to change to DPNs or use magic loop as the number of stitches becomes too small for the circular. 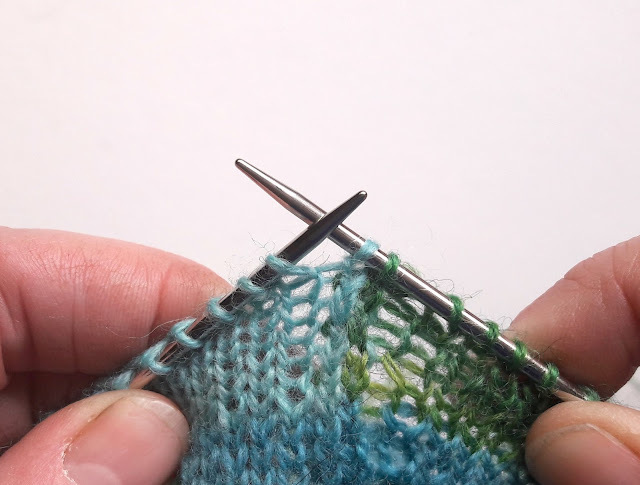 It's up to you when you choose to do that, and how you distribute the stitches across the needles; just keep following the pattern as set below. 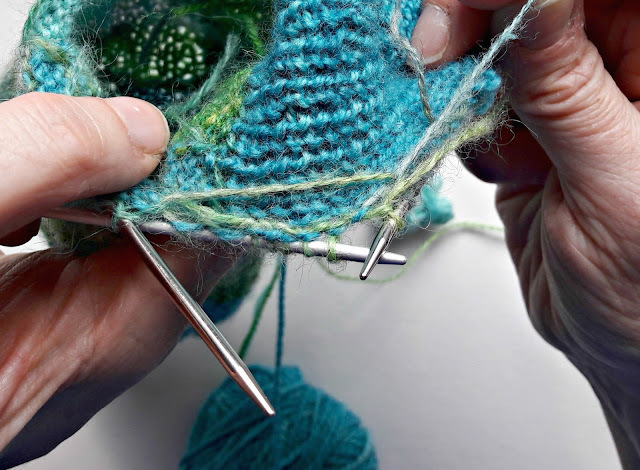 If you have cast on more or less than 60 stitches, you will need to adjust the number of stitches between the decreases to accommodate this. Repeat rounds 2 and 3 until you have 28 stitches left and divide these between two needles so that the front and back of the socks match (14 stitches on each needle). 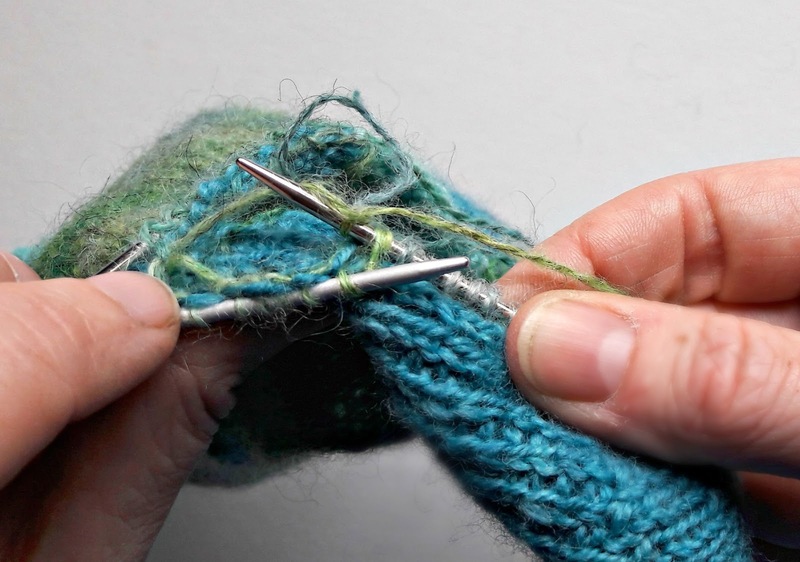 you'll find that you can tighten the stitches up by taking a wool needle and wiggling the stitches. 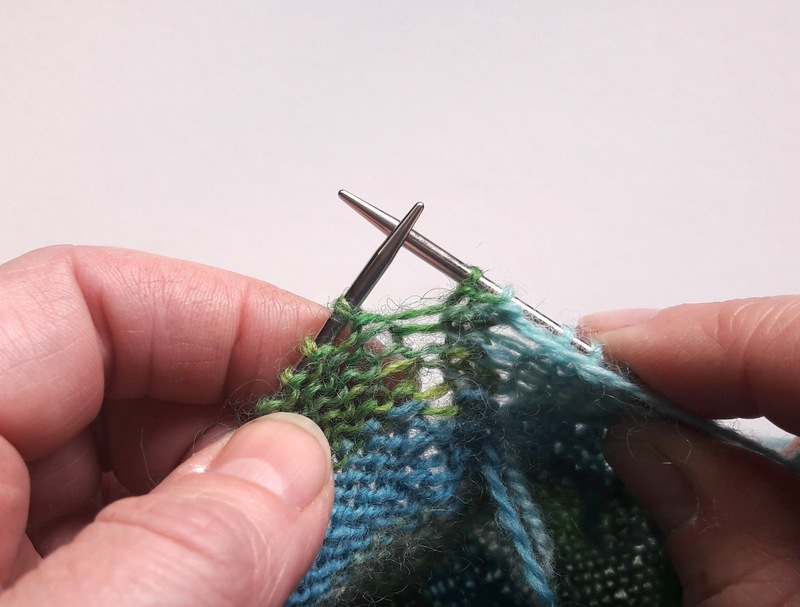 This is why you kept the wrap quite loose; it allows you to re-align the stitches and you'll find that washing your sock will adjust the stitches too. This is what mine looks like after I've done a bit of stitch-wiggling. Much better! 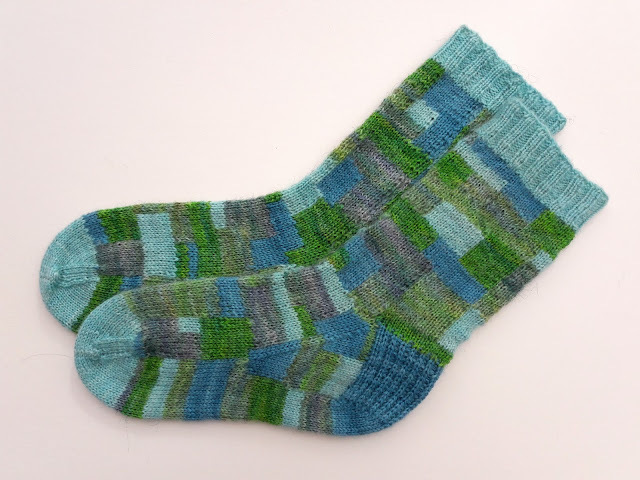 Don't forget to link your socks on Ravelry so that others can admire them, and if you would like to share them on other social media platforms, there are hashtags of #patchworksocks and #winwickmumsocks. I'm really looking forward to seeing how your patchwork turns out! looks like an awesome challenge! love the colours! You are amazing, love the pattern and way you provide video, I also like how you mentioned "it doesn't hurt to try something new, if you don't like it don't do it again" felt you were talking directly to me ... fear of the unknown grips me many times. Just received all the posts I missed - thanks!